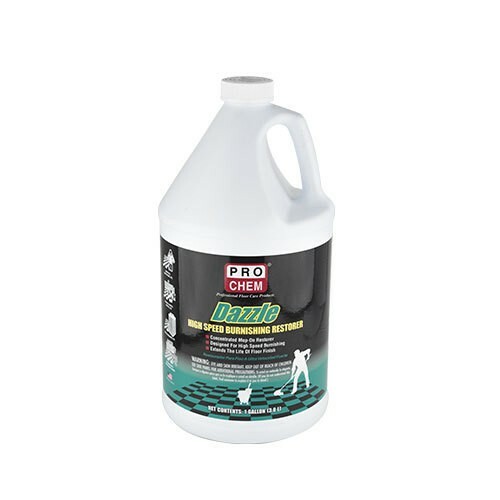 Dazzle | Pro Chem, Inc.
DAZZLE is a high speed, dilutable finish restorer that prolongs the life of a floor finish and restores that “wet look.” Formulated with solvents that soften the finish and facilitate the abrasive action of the pad. Itcan also be used as a one step floor cleaner/restorer when using an Automatic Scrubber. Mop-on/Burnish Restoring: Dilute one (1) part DAZZLE to three (3) parts water. Mop one thin coat of diluted product directly onto floor. Can also be diluted into a quart bottle and sprayed on the floor. Allow to dry completely and burnish with ultra high speed buffer. One Step Cleaning/Restoring using Automatic Scrubber: Dilute 2-4 ounces DAZZLE to one gallon water. Use soft poly brush or the least aggressive burnishing pad such as white or champagne.